A Dutch snowboarder has been fatally injured in the second avalanche to hit the French Alps in 24 hours. Two other snowboarders are also missing after the avalanche struck in the ski resort of Valfrejus, in the Rhone-Alpes region of south-east France. The avalanche hit the off-piste sector, close to the Italian border on Tuesday afternoon, March 7. French authorities have confirmed that three snowboarders, aged between 20 and 25, were swallowed by the snowslide. Due to poor weather conditions, there were delays in search and rescue, and Annick Lago, an employee at Modane Town Hall, near the ski resort of Valfrejus, said rescue teams had to continue the search on Wednesday. Ms Lago said the winter sports enthusiasts were part of the same group. An earlier downrush of snow struck the nearby resort of Tignes at 9.50am local time (8.50am GMT) and there were no fatalities. French media earlier reported that several skiers had been caught in the sudden snowfall. "Several skiers were knocked around and taken care of by resort employees," the resort's press service said. The risk of avalanche in Tignes was four on a scale of five on Monday, with weather reports warning of a high risk of snowslide due to a metre of snow falling in the last few days and strong winds. Four snowboarders died in February in another avalanche near the Tignes resort. 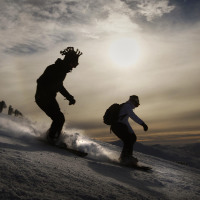 The UK Government has issued guidance to prepare for skiing and snowboarding breaks, including medical check-ups before travelling, undertaking avalanche training and having sufficient travel insurance cover. Stats from ABTA suggest that a third of travellers fail to check they have appropriate cover before they head off on winter sports breaks. Tragedies on the slopes prove it is vital to be prepared, and winter sports travel insurance is essential.